Anti-nuclear cartoon book, 1978 – anything changed? A few weeks ago, Haydon Manning passed me an interesting book from the more dusty section of his shelf. 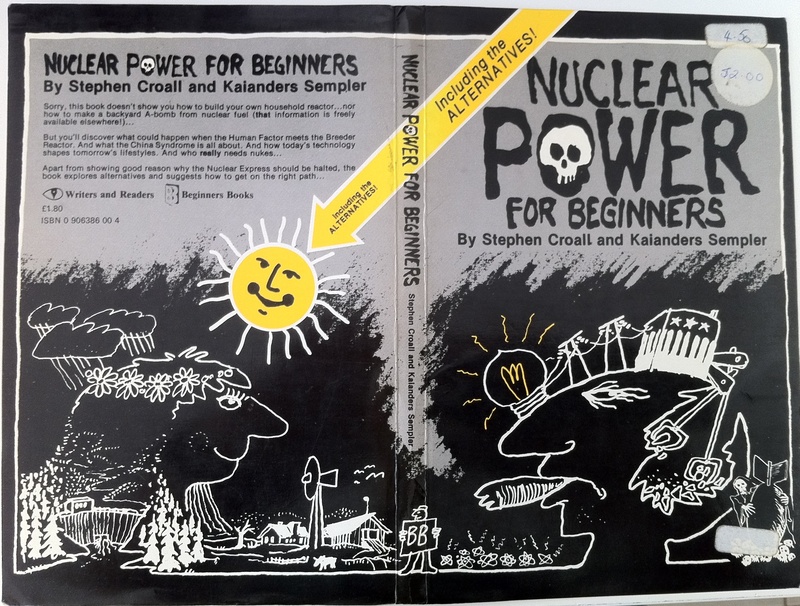 It was called “Nuclear Power for Beginners“, and the edition I have was published in 1978. (If you do a bit of searching, you can still find old copies for purchase). If you’ve read this post from 2010: From nuclear sceptic to convert, you’ll know that Haydon was himself once anti-nuclear, but has since been convinced of the need for nuclear power. So I guess that when he bought this book, its contents aligned very much with his views (and those of the majority of environmentalists of the time). Like me, however, Haydon is now off the Christmas card list of Friends of the Earth! Apparently, it was first published as “The Anti-Nuclear Handbook” but was then re-titled to fit with the popular “For Beginners” series. The cover says it all really — a death’s head in the word “Power”, the black and gloomy background vista, the corporate polluter with a nuclear power plant on his head, and the bright ALTERNATIVES! (with a happy, smiling sun). The book covers all of the core anti-nuclear arguments — power plants are unsafe (and remember, this was published before Three Mile Island, Chernobyl or Fukushima — so they relied on Windscale, Chalk River, SL-1 etc. and good old speculation), nuclear waste is intractable, the risk of weapons proliferation is enormous and growing, fast breeder reactors just make everything worse (and are theoretical anyway), and so on. But it’s the conclusion that interests me in particular, especially in the context of the arguments being presented by commenters in the Energy debates in Wonderland thread. There is a description of a meltdown on p51 (with the fuel inexorably melting through the reactor pressure vessel, leading to a steam explosion that bursts containment, “while the molten uranium burns down into the earth“), a discussion of the French approach, p52 (amazingly, they were talking about ‘core catchers’ even then — it’s not just an EPR thing! ), and throughout, an unquestioning connection between radiation and the inevitable consequence of genetic defects + cancer. There is also a lot of space devoted to the argument that as the fuel cycle stretches around the world, the risk of sabotage and nuclear terrorism will become immense (this starts on p85), and that once the fissile material is available, the ‘do-it-yourself’ bomb kit( in an urban guerilla’s cellar) is but a few steps away. Saying ‘no’ to nukes means saying ‘yes’ to something else. Little would be won if it meant saying ‘yes’ to ferocious consumption of coal, oil & gas… their risks are well know [various damages then listed]. Remember, this was 1978 — yet it all sounds awfully familiar, doesn’t it? We’re still having these same debates today. Nothing has really changed. And the hard reality is, 32 years later, that coal, oil & gas HAVE won (so far). [As a slight digression, I’ve always found the classic ‘libertarian’ view of nuclear power and ‘enviro-leftist’ view of renewables to be equally confusing. Nowhere in the world has nuclear power been built on a large scale without significant government co-support – actually, this seems to be true of ALL national electricity infrastructure, including coal (can anyone name any exceptions?). Yet many free marketeers are strong supporters of nuclear power, whilst at the same time they dislike renewables and any subsidies given to them (including, of course, the carbon tax). Conversely, most people who argue passionately for the need for direct subsidies for renewable energy, carbon prices and mandated programmes for energy efficiency, also really dislike the fact that nuclear power has historically got similar type of support — and could continue to do so. I’m asking this question out of sincere interest, rather than try to say whether such ideas are inherently ‘good/bad’ or ‘right/wrong’ -– as BNC readers know, my evolved view is that whilst renewables are based on some fascinating technology, they remain essentially unable to support a large-scale move away from fossil fuels. Only a significant reliance on nuclear energy can permit this. So I wonder if it ultimately comes down to a form of unavoidable ‘cultural cognition’, whereby nuclear power is generally equated to high energy density and industrialism/consumerism, whereas renewables is intuitively connected by many to natural landscapes and sunny/breezy environments. Anyway, back to the book. The ALTERNATIVES! highlighted on the book’s cover, are naturally a reduction in energy use (conservation), anincrease in efficiency of use, and large-scale adoption of available renewable technologies, including solar PV, solar thermal and wind. Amory Lovins and his ‘soft energy pathways’ is quoted extensively (including his ‘fossil fuel bridge’, which should have apparently allowed renewables to gradually increase to about 40% of supply by the year 2000 and 100% by 2025). Indeed, it’s called “The Benevolent Way” (p126) — “to promote the decentralisation of political and economic power, redistribution of wealth and the liberation of the individual… the struggle for a soft energy future must be linked with the struggle for political change“. Question: Is this the China we see today? So there we have it. We can reflect on why the soft energy path was not taken, and argue that this was because the concomitant socio-political shift didn’t happen (irrespective of whether you consider this pathway to be inherently good or bad). But again, I ask the question (trying here to take a completely apolitical position): if this shift failed to materialise in the past, why should we expect this to change in the future? What’s wrong with this? Well, the error of logic is that the scientist on the left is correct, and the one on the right is wrong. 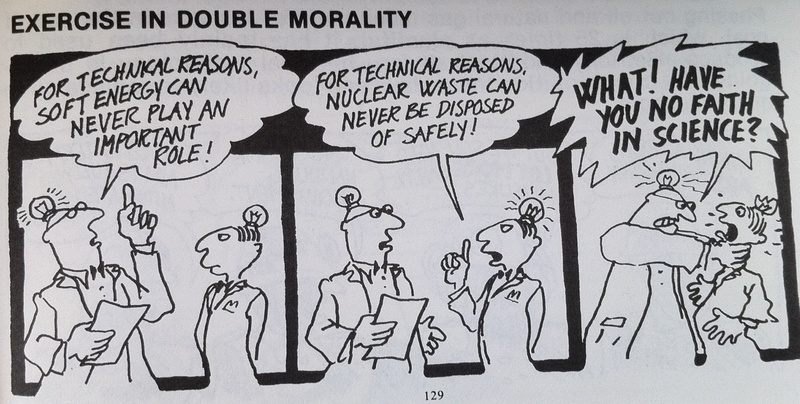 The problems of nuclear waste disposal are social and political, NOT technical. So there are no double standards here. Again and again, these issues are being confused. Finally, to the appendix — which is all about the great potential of those ALTERNATIVE! energy systems. On flat-plate solar collectors, they say “now they are in great demand in the US, where sales are trebling annually”. Solar cells turn sunshine into electricity. They are still extremely expensive but a major cost breakthrough is said to be imminent. In the US, government and private capital is being poured into solar cell technology, which lends itself to monopoly. The same can said of solar [thermal] power towers, electric energy systems now being built in Sicily, France, Spain and the US. Ground mirrors provide the heat to turn a steam turbine in the tower…. I sigh. It’s all so eerily familiar. The renewables dream of the 1970s are the same dreams of 2010s. All these ALTERNATIVE! technologies were ‘on the cusp’ of a breakthrough… and still are. Meanwhile, for 32 years and counting, many well-intentioned folk continue to block nuclear power, and the Earth’s environment goes to hell in a hand basket. Meanwhile, we burn more and more fossil fuels. Little really was won. I gave up reading comics at least 50 years ago.They do have a useful function in helping children to gain literacy skills but by the early teens they should be reading books,books and more books. My 2 children were read to from an early age and quickly acquired the reading habit. We, as humans, are not in a position either to create or to redesign a planet that is, in essence, nothing more than an accident of Nature. If anything appears on Earth that is of use to us, then we are fortunate. If such a thing does not appear on Earth, perhaps contrary to our expectations, then we must be resigned to the fact. I sympathize with those who, since about the 1960s, have been putting all their money into the bottomless pit of the “alternative energy” industry, but my compassion does not extend to prevarication. There is really no sense in devoting vast amounts of time in trying to prove that 2+2=5. But the case is worse than that: unfortunately, so many people who get into discussions over “alternative energy” have simply never bothered to do their basic homework. Honest question: what authorizes you to say so definitively what is technical, rather than social, about nuclear waste debates? Do you have any qualifications in Sociology of Science and Technology? Or law? Not really an ‘oldie’ but a good representation of the times. I was already pro-nuke, and still in the Army when that was published. Looking at the Greens of the world, not much has changed. Oops! The Californians didn’t save any energy, just had slightly less growth in energy consumption, and even that is mostly because their expensive electricity chased energy intensive industry away, increasing energy imports (which of course are not added to the balance – pollution elsewhere). posted 25 April 2011 at 8:48 PM by Cyril R.
Well, if it’s not technical (and it’s obviously not, we are already storing nuclear waste, and we know we only need do so for a few hundred years) then social causes are all that is left. Not that that isn’t a significant problem in itself. dk.au, the engineering solutions to nuclear waste are well known, so the problem isn’t technical. The social commentary on the topic is not informed by the technical solutions, so the problem is social. You don’t need a Masters in Sociology to see the nose in front of your face. Generally speaking. No, but you may find such study useful if your objective is not to see it. dk.au, you might find this paper, Cultural Cognition of Scientific Consensus interesting. It is published by the Social Science Research Network and explores why people resist conclusions that have a scientific consensus – their examples being human-caused climate change and safe nuclear waste storage. Section 5.3, Improving Risk Communication, is worth a read for everyone. Thanks for the link to that excellent paper, Joffan — I’ve added the hyperlink to my main post, where I talk about cultural cognition. “Sun power is now a fact and no longer in the ‘beautiful possibility’ stage[…] It will have a history like aerial navigation. Up to twelve years ago it was a mere possibility and no one took it seriously.” – Frank Shuman 1910. You make some very valid points, but I am somewhat surprised that you admit to being confused as to why arguments which have been ongoing since 1978 haven’t been resolved. In general, people don’t like receiving very bad news. If they can listen to other views that contradict the doom merchants, they will probably believe the latter, particularly as most will have neither the time nor the scientific training to be in a position to evaluate the case in an objective manner. It was only after my retirement that, almost by chance, I started reading in depth about the problems we face. Before then, I had some vague concerns that we were gradually messing up and overpopulating the planet and that somebody (else) ought to sort this out while I got on either with my preferred research project or attempting to make more money. My post retirement reading led me into all sorts of areas and disciplines with which I was unfamiliar, but of which I had to have some sort of knowledge before a reasoned judgement could be made. Few have this opportunity and scientists, in particular, are renowned for knowing more and more about less and less. My reading led me to a near state of gloom/depression. I hadn’t realised quite how close to the “cliff edge” we were. To combat the depression, a sustained period of searching for solutions followed. Before too long, it seemed to me that nuclear fission was the last best hope of mitigating a disaster. However, I would refer you to the posting by anon on 17th April at 5.29am on the Fukushima Philosophical Thread and, in particlular, to the point that demographic trends are such that we may have left things altogether too late to save ourselves. I think that too much focus on AGW is not necessarily helping the nuclear renaissance argument. (It encourages antis to argue over relatively trivial issues like a few dozen or even thousand radiation deaths as if they are of any significance relative to the scale of deaths we can anticipate in a generation or two if we don’t adopt nuclear power. We live in a death-denying culture.) Our primary problem is population overgrowth and the understandably rising aspirations of those in emerging nations. AGW is but one of the many planetary boundaries that we are approaching. At the time of my majority, there were 3 billion people on the planet. Now, in half a century, population has more than doubled. In another half century, 3 more billion will, in theory, have been added even if female fertilty rate drops to replacement level. Over the same period, planetary carrying capacity will plummet unless we can replace fossil fuels with an alternative energy source that is reliable, cheaper than coal, supplies high net energy and is scaleable. I am unaware of anything other than nuclear that can come close to fulfilling these criteria. Many pro nuclear and AGW believers attempt to deploy their arguments in a manner that reassures that there is a solution available to us that won’t rock the boat (a don’t frighten the horses approach – to change metaphors). Barry, as you mentioned above, this approach has been being tried since 1978 without obvious success. One might have expected that the nuclear industry, for example, would be screaming for a nuclear solution. Instead, they seem to be quietly lobbying to replace obsolescent plants and expand in a modest manner. Areva is even expanding into the renewables field. If nuclear were such an obvious answer, why aren’t the oil companies, knowing as they do that their reserves are under threat, moving investment funds into nuclear power? The answer to the above quesion is not difficult to answer. It doesn’t make sense for companies in liberal democracies to invest in nuclear unless they are encouraged or directed so to do by governments. Unless governments realise in time that the future is so scary as to require strong interventionist policies and, in democracies, persuade their voters of this and of the necessity for, at least, short term sacrifices in order to implement a crash programme of energy transition, rapid nuclear deployment won’t occur until too late. At present, democratic leaders and their citizens are paying lip service to a problem that they don’t seem to anticipate will be of much greater consequence than Al Quaeda. The West has been maintaining lifestyles by going into debt and running down its asset base. Assets have moved to the emerging economies in the East. I believe that the immediate implementation of a crash nuclear infrastructure deployment may be the only thing left that can save democracy. It’s too late for governments not to pick winners. Unfortunately, the pro-nuclear position has not changed much since the 1970s either. The construction costs will come down as we build more plants. We will convince the public that nuclear waste can be handled safely in the next several decades. Power companies will take a long term view rather than a short term view. Democracies will decide on the rational merits of the case that nuclear electricity is the best way to go. What would it take to get nuclear electricity to be legal in Australia? What would it take to get United States democrats to encourage nuclear electricity? What would it take to get Canada to build its new reactor? It seems to me that the entire future of nuclear electricity is based in China. Do the construction techniques of the Gen III reactors really reduce costs when a fleet is built instead of just a plant. China will show us. Do fast reactors burn up spent fuel effectively? China will show us. Do liquid fueled reactors cost less to build and operate? China will show us. May the Chinese operators be vigilant and successful, especially at Sanmen (AP1000). some stuff has changed since 1987. for example the peak of German solar power today again was above 11 GW. that is about what the remaining nuclear power plants generate. Germany also has made a plan to retrieve nuclear waste from the failed storage attempt in the Asse salt mine. As part of my comment above was moderated,presumably for my use of a certain word which describes the intellectually challenged,I will try to explain my position more fully. The use of sequential cartoons,otherwise known as comics,has been a propaganda tool for a very long time.The fact that they were/are judged to be effective on adult “readers” is an indication of the “thinking” processes of a large part of the population,perhaps a majority. With electronic media now predominatiing the problem is so much worse.There is virtually nil interaction or effort required in viewing television,therefore no thought,let alone sceptical thought,is required.The potential for sublimal messages to be imparted by television is well known,particularly to advertisers. Yet television is what a very large proportion of the population relies on for information as well as entertainment. I don’t hold out much hope of influencing substantial numbers of the population to take climate change and energy provision seriously.As Douglas Wise says in his excellent comment above,it is time (well over time) for the government to pick winners. We are in agreement. The important countries now are China and India. China will soon have technical parity with the West in nuclear generation from technology transfer. From then on they will be moving ahead of us. That will strongly motivate India (if it hasn’t already). China has already indicated it will investigate the molten-salt thorium reactor. We’ll see how that goes. The United States and Europe are of course not unimportant, but I think they will see what China is doing in the decades ahead and conclude: ‘We are idiots’. I think with sufficient will the West will catch up and it will only take a couple of decades to do it (look at France’s example). So, I agree. China is critical. I am optimistic but we will have to see how it goes. @Podargus – I agree with you fully on the matter of comic books and other forms of intellectual pablum that have become endemic to our culture. However in this case we must note that as abhorrent as they are to us – they work. What we need is a pronuclear comics to delver our message to the masses. Anyone with the talents out there willing to give it a shot? states that it uses measurements from 13% of the PV installations in Germay. That sounds OK, but the graph of power output versus time (through the day) is a perfectly symmetric curve (looks gaussian). That is a bit suspicious, especially if it is the same perfect shape every day. well: as I’ve said, in the winter, the graph of german solar pv often showed the system getting under one percent of its nameplate capacity. and, as cyril points out more than once, solar cf is 11 %. At least in the US, the inflation adjusted price of coal declined from 1979-1999. In addition we overbuilt ‘baseload’ capacity in the 1970’s and 1980’s which meant our existing nuclear fleet was underutilized until around 2000. Since the ‘baseload construction’ market in the US was virtually non-existent there was no point in engaging in public education campaigns. Nuclear was substantially more expensive then coal and that didn’t appear likely to change. New nuclear had to be sold on environmental grounds or not at all. Then around 1999 the productivity of US coal mines east of the Mississippi began to drop and coal prices began to rise. One can now make a ‘reasonable’ case to build nuclear in the US Southeast on purely economic grounds under some very specific circumstances..I.E. As a replacement for aging baseload coal fired generating capacity that has reached it’s full economic life. In Asia China was exporting steam coal for $27/tonne in 2002-2003. China is now importing steam coal at $120-$140 tonne. The economic case for nuclear in Asia is strong as a result. The same goes for most of Europe. as we switched off 7 nuclear plants, it is quite good to have solar support at the time when it is needed the most on “sunday” (holiday). Barry asked the question “anything changed?” and some things did change indeed. like solar, which s a real option today. and for example we had multiple massive accidents, as predicted by those who oppose nuclear power. I believe that nuclear power has to be made cheaper than that from coal. I also think this can only happen if governments decide to make it happen. If, instead, they leave matters to the free market to determine the outcome, progress will, at best, be too slow. Barry has essentially made a similar point in his post that started the thread. I am basically a free market capitalist, but acknowledge that this often forces the adoption of a short term rather than strategic view. It is supposedly governments that should be planning long term and considering major infrastructural needs. However, in democracies, this seems rarely to be possible where electorates tend to give primacy to immediate gratification. His article on TheOilDrum suggests that (economically minable) coal runs out far sooner than anybody previously thought. SteveK9; I think that website on German PV output is pretty good. See 16 April if you want a non-Gaussian day. Winter days – or even weeks – around the solstice can be pretty brutal, maxing at 1 or 2%. Me too, I have been tracking coal markets as a hobby for the last couple of years. 12 months ago $90/tonne for steam coal seemed like an insane price, but we are currently seeing $130/tonne for steam coal in Asian and European markets. Obviously, some coal fired plants in the US Midwest and Australia have access to large supplies of coal at ‘mine mouth’ prices. FOB and CIF prices can be substantially higher then ‘mine mouth’. The mine mouth price of coal in Wyoming per MBtu is 76 cents. By the time is gets shipped by rail to South Carolina it’s almost $4.00/MBtu…add a boat trip to Asia or Europe and it’s up to $6.50/MBtu. At 76 cents/MBtu nuclear doesn’t compete with coal economically at all. At $4/Mbtu it can compete if it gets ‘preferential financing terms’. At $6.50 coal isn’t at all competitive. DB Rutledge, Aleklett and Heinberg are all saying most FFs are parlous but few are listening. We should ask why US coal exports to China increased 5-fold between 2009 and 2010. I believe Rutledge uses a general circulation model that says warming will top out at 2.6 C. Trouble is firestorms and Cat 5 cyclones are bad enough with 0.8 C warming. Right now I think we have the concurrence of world peak oil and China peak coal. In Australia the suits tell us it’s all good but I think it could easily implode. Coal is being influenced by the increased price of other fossil fuels consumed in mining and transport. If you buy into the more all-encompassing claims about nuclear, the mining equipment and cargo trains could get their power from a reactor. Nuclear needs to close the harvesting loop with non-carbon energy, or it too will be affected at every step of the supply chain. Relgoshan, that will be okay, as it will strengthen the argument for closing the nuclear fuel cycle sooner rather than later. Nuclear needs to close the harvesting loop with non-carbon energy, or it too will be affected at every step of the supply chain. Very true! Nuclear will have some insulation due to itshigh EROEI, but the limitations of diminishing fossil fuels will bite sooner or later. I know many here think that a drive for complete electrification is the best path, but I think we should initially go down the synfuels route because the vehicle production and fuel distribution infrastructure already exists. China has become the leading producer and installer of wind and solar (thermal and PV) in the world by dollar value in 2010. They have invested 54.4 B$ in these technologies 2010, 45 B$ in wind specifically. They now have the worlds highest PV and wind turbine production. (same reference above, but also in IEA world 2010 reports) This, in a country that until just a few years ago was expected to not break from their carbon intense coal reliance. Predicting energy paths is perilous work. I can do one better, every day solar gets ~0% of net energy output. Storage is key for baseload, and BTW this is how the debate has shifted we no longer talk of renewables being a possible solution but pretty much the best solution during peak loads. I fail to see what point you are making about storage and renewables being the “best solution during peak loads”, other than it’s relevance in a proagandistic or PR sense. 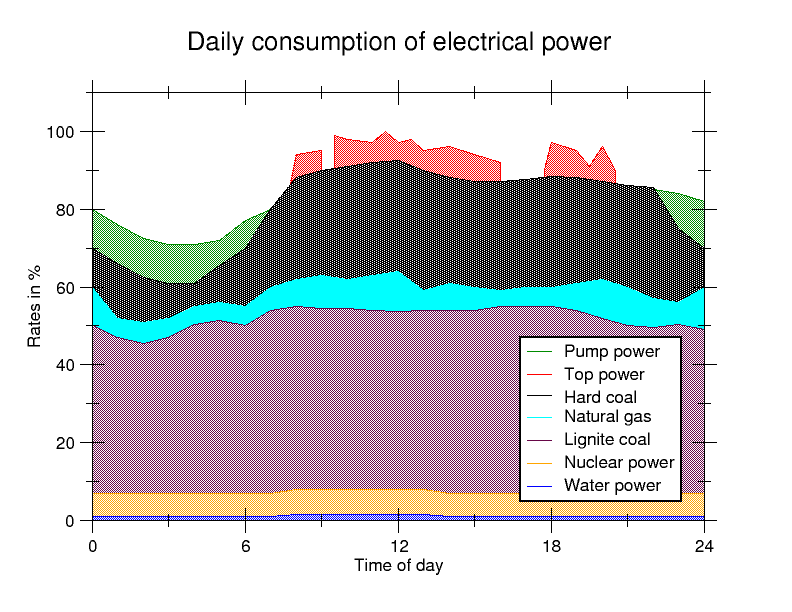 Storage would benefit any form of electricity generation in dealing with peaks. It probably favors coal and nuclear more because the sizing of the required storage is more deterministic and less probabilistic. The fact that storage, other than pumped hydro, has thus far only been deployed on a trivial scale anywhere surely suggests that up to now it is too expensive. That may change, but until it demonstrably does so on large scale, betting the future of the climate on such vague promises is just a bit risky. Storage is key for baseload, and BTW this is how the debate has shifted we no longer talk of renewables being a possible solution but pretty much the best solution during peak loads. Storage is only ‘key to baseload’ if you have no control over the scheduling of your generation. It is a testament to the uselessness of non-hydro renewables that while advanced or speculative engineering solutions such as economical power storage, or the mythical smart grid may well provide efficiency gains for reliable generation technologies, renewables such as solar and wind are absolutely dependent on them. 1) I oppose misleading technical accounts regarding the technology, it’s safety and cost. 2) I oppose nuclear prohibition. However I also oppose most drug prohibition, the prohibition on paying people low wages, prohibitions on prostitution, prohibitions on euthanasia, prohibition on abortion. Opposing prohibition isn’t the same as being in favour of an activity. I can oppose nuclear prohibition without believing nuclear power plants should be built irrespective of cost. On the issue of carbon taxes. I think a carbon tax is the right way to frame the policy response to AGW. However I think we have enough explicit and implicit carbon taxes already (fuel taxes & MRET etc). And I think the benefit of internalising the cost of CO2e emissions is very marginal. Clearly there is room for some serious tax rationalisation however. We should get rid of MRET and broaden (and lower) the fuel tax by including fuel used in electricity generation. I don’t advocate making nuclear competitive via a carbon tax on fossil fuels. I advocate allowing nuclear power as an investment option and then leaving it to industry to innovate on costs. Let the cheapest energy source prevail. The peak output of 11 GWe is only achieved for a few hours on sunny day. Its zero at night and near zero in winter. Notice that the SMA website does NOT show nighttime in the graph. This is because it makes solar look better, hiding its zero nighttime output. Remember, SMA is a solar company, they sell things like inverters and need to make solar look better than it is. However that means that their data certainly won’t be expected to be too low. This worries me because the performance is pathetic. And that last link, mind you, is for the Arizona desert! You can’t power countries with this!!! steve lapp: Figures without perspective might win debates at the pub, but they should be avoided if you want to understand what is happening. Here’s China’s electricity by fuel type graph through to 2008. Is wind or solar big enough to be visible? No. hit … say 10 percent? Keep in mind that as oil runs out, everybody will need far more electricity than is being produced today. rock solid for more than a few decades. China 2010 wind production was about 41,000 GWH, or about 340 times your data, or a bit over 1% of their total production. This, after about 5 years of even being a player in this field. i understand that they have an interest in making solar look good. but the obvious reason for not showing nichttime on that animation is, that it would be extremely boring to watch. daily capacity factor makes sense, but it is not the only number that is important. pure pumped water storage should actually have a NEGATIVE daily capacity number. mots of the time it wont have an extremely good one at least. but it obviously is a useful thing to have! solar follows peak demand very well. it delivers electricity at a time, when people are willing to pay for it. as i showed you before, in France all that nightime nuclear power is sold at about “/3 of daytime cost. the link that you gave above is completely useless. basically it is full of comments by you, posting morning solar output in november. it demonstrates, that nightime energy goes into pump storage, which, together with serious price reductions that support wasteful electric heating, is the reason why quite a lot of those demand graphs look flat. simple rule: if you need electricity at 3am in winter, solar might not be your source of choice. if, like the rest of the world, you worry about climate systems on sunny days, you should take a second look at solar. Steve Lapp, China’s total electricity generation for 2010 was around 3.5 million TWh. Wind generation by your numbers was 41TWh. You want to revisit your percentage calculation? Solar output goes down just as the evening peak sets in. Not terribly useful. They also need more power in winter, when solar is pathetic at 1-4 percent daily capacity factor. I can see a use for standalone solar systems making ice or chilled water during the day, to power airconditioning, but not for Germany. Germany’s electric problem is coal pollution, they have some of the dirtiest plants in Europe, which kill many by lung cancer and other nasty diseases. Not to mention spew CO2 like there’s not tomorrow. Nuclear can displace those coal plants 1:1. Solar is marginal in doing this. Then there is China which is growing electric demand so fast its crazy. They have cheap reliable coal plants, they will not accept expensive unreliable wind and solar that are not there 70-90% of the time. This is the dismal science. Get over it, and move on with us! sod, I agree that solar’s production profile is correlated to the typical daily demand peak – although, in Germany, not the yearly demand peak. And that does make it something that could contribute15-20% of grid electricity, at least in the less expensive solar thermal form. Unless there are (as there are today) other generators that can generate responsively, and will be needed anyway in winter. On storage, I notice that you talk about the low price of French night-time electricity. Think about that for a moment – if storage was either easy or cheap on a grid-powering scale, that electricity would not be sold cheap, but stored and sold at peak. And shifting a regular supply to match peaks requires a hell of a lot less storage than shifting an intermittant supply for the same demand. Joffan, according to that link, China generated 3,446 billion kilowatt hours in 2009. That is 3,446 TWh (1 TWh = 1 billion kWh). So 41 TWh is 1.2 %. For Germany, there is also an evening peak, matching even less to solar, in addition to the bigger problem that Germany needs most energy in winter, when its cold and dark (heating and lighting required, people are all snug inside watching their big screen televisions, etc.). Just so happens that solar output is not there 96-99 percent of the time in winter. Oops! As for China, they are on track for doubling their electric demand to over 6000 billion kWhs, 50% more than the USA is using today. Total non-oecd asia is also on track of hitting 10,000 billion kWh by 2030. Oops! posted 27 April 2011 at 2:36 AM by Cyril R.
Cyril, i do not think i will convince you about solar better fitting peak demand than a flat line, even though everybody should be able to see it. i completely agree with you about there being too many coal plants and they having bad effects, especially CO2. but “dirtiest plants in Europe”? i searched only for a short time, but this article seems to disagree with your assessment. China is the worlds leading installer of all things energy except possibly natural gas. They built more coal fired plants in the last year then the US built in the last 20 years and the price of coal in the US is cheaper then in China. There is a substantial difference between throwing away something that is still ‘fully functional’ and replacing it with X,Y or Z or starting from scratch. What do you consider to be the most important objective for environmental action, and which should take priority? Action to shut down nuclear power generation, or action to counter AGW by reducing greenhouse gas emissions and other measures? Ignoring this question will not make it go away. Cyril – solar is not perfectly correlated to demand, no, but I think well enough to be a positive point. I was not intending to overstate the corrleation if that’s how you read it. The contrast is wind; this is not correlated to demand at all. Barry – thanks for the review and correction. Perhaps I need new glasses – I misread the decimal point as a comma. Renewables have serious problems scaling and nuclear has a serious image problem but scales brilliantly. Only a second look? Mate, I’ve looked at solar PV every which way yet all I am left with is huge subsidies out of my own pocket via feed in tarrifs, increased taxes to support capital costs and federal government recoverable energy certificates (REC’s), reduced safety outcomes with respect to some other options, eg nuclear, dreamed up price estimates of $1 per watt where more is left out than has been put in, manufactures making 40% loss on annual turnover (First Solar), manufacturing processes with environmental issues, materials supply constraints re Rare Earths, inability to be scheduled, unknown numbers of homes with leaking roofs due to the attachment methods, unfair sociological outcomes as those with disposable incomes and a private single occupancy dwelling PV panel owners feed at the trough of public largesse while those who cannot or do not own their own house, renters, unit dwellers, the old, those on minimum income, the young and the poor are forced, through skewed tarrifs to shell out. Mate, I have looked at solar PV a dozen ways and more. What I see is too often a feel-good, expensive dream; a scam; a diversion from the real game which MUST be the provision of affordable and reliable energy to an energy hungry world in a way that does not destroy our climate and our species as a consequence. By all means, solar pundits are welcome to solar PV dreams, but not to dress them up in untruths and mistruths or to demand that I and others change our ways to suit the foibles of their chosen energy source. If I want to get power during the 80% of the day when PV is asleep or missing in action, that does not make me inadequate: it shows up the inadequacies of the PV Dream. Morning and evening peaks are a fact which solar gurus choose to ignore at their peril. Summer mid-day peaks likewise. Some solar pundits strike me as being like small children, throwing a tantrum in an effort to have their way and rejecting reasoning and patience. So, solar pundits, love me or hate me, that is where PV fits into my world. Want to convince me cto change my mind? Easy, abandon public subsidies, promote an energy source which is safe, scaleable, cheaper than PV ever will be, has minimal demands on storage, is reliable and is based on proven technologies. But please, solar pundits, do not demand that I must “take a second look”. That happened years ago and nothing has changed since. John Bennetts, on 27 April 2011 at 11:33 AM — That was impressive. A great deal of investment is being made in PV technologies. I was fortunate enough to spend a couple of hours with Eli Yablonovitch of ALTA technologies recently. He has secured about $200 million from mainstream investment houses for commercialization of thin film technology that has achieved impressive above 25% conversion efficiencies. BP has a slide show with some experinece curve data for Si based technologies. http://www.lesker.com/newweb /news/jpg/BPSolarSidhu_4-13-2010.pdf that is encouraging. Yablonovitch tells me that PV conversion efficiencies of up to 60% are possible with contunued progress in nanotechnologies. I am not going to bet my life on PV, and I am vary aware of research promise versus commercial success, but to count PV out amidst all the evidence to date of reducing costs and improved performance is a bit premature. Here in the UK, we just had what is pretty much a night of films about nuclear energy on one of the main television channels. The films shown represent somewhat a ‘cartoon’ image of nuclear power. The first was ‘Into Eternity’ on the Finnish repository, which had some nice imagery and music. However, the director/narrator repeated the ‘100,000 is how long Onkalo needs to survive’ over and over. Way too dramatic IMO, and transmutation was instantly dismissed as unrealistic or even dangerous. None of the serious technical issues were discussed, and instead the narrator seemed obsessed with philosophical issues. The second was ‘Heavy Water’ which was essentially an hour of poems and recantations about Chernobyl. Very sad, but again very overly dramatic. while they are mortified by nuclear incidents with no fuel related fatalities. Or they like to think the nasty coal business will soon go away once a few windmills and solar panels are installed. 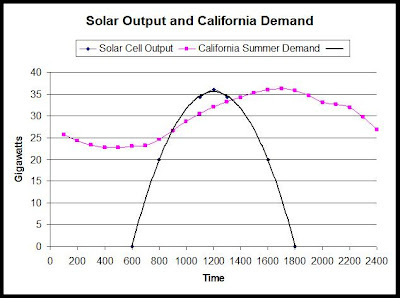 Solar output is ZERO at peak demand in California, so yes of course a flat line is a better match to peak demand if that’s what your peak demand looks like. Sod, solar does not match peak output well at all, this is counter-intuitive, but when it comes to matters of energy, you cannot trust your intuition. You need to check these things with real world evidence. Obvious things are not obvious. Nuclear may appear dangerous, but has the lowest death rate per TWh of any energy source, including Chernobyl. Nuclear is compact, energy dense, and highly productive. Because of these factors, nuclear can be made safer than other sources, and that’s exactly what it is. Solar in the desert may appear productive, but again the numbers show otherwise: it is not there 80% of the time. For example, the Springerville Generation Station is in the desert, and gets 18-19 percent capacity factor (not there 81-82 percent of the time and not dispatchable). Being able to deliver electricity ‘on average’ is not important!!! Electricity must be supplied reliably always, every second, minute, hour, day, month, year, decade. It is hard enough with dispatchable and highly productive fossil fuel power plants, it is impossible with erratic, unproductive and non-dispatchable solar and wind. posted 27 April 2011 at 6:20 PM by Cyril R.
Averages 860 kWe AC fed into the grid from 4590 kW peak DC installed. 18.8 percent capacity factor. (actually 0.188 capacity factor to be technically correct). posted 27 April 2011 at 6:24 PM by Cyril R.
Costs 5 Canadian dollars per Watt peak, gets 17 percent capacity factor IF it works as well as designers claim. This makes for 29 Canadian dollars per average Watt, absurdly expensive for nondispatchable power that is not there 83% of the time. Not to mention the giant e-waste this is going to make: cadmium is very toxic, and will have to be guarded FOREVER as it has no half-life. Recycling of cadmium isn’t a pretty process, either – not perfect, some cadmium is lost and you need a lot of nasty chemicals. posted 27 April 2011 at 6:40 PM by Cyril R.
Oh, and did I mention that near the US-Canadian border, there ain’t much airconditioning loads for solar to (actually not very well) dovetail? posted 27 April 2011 at 6:41 PM by Cyril R.
1. Fukushima is still leaking radioactive material into the environment. Japan was saved from a disaster that could have displaced 100s of Million people, by lucky wind directions. 2. the longer running times of nuclear power plants, which were ordered by our conservative government last year were BLOCKING the development of alternative energy. going out of nuclear and saving CO2 are not a contradiction, but can happen at the same time. so i am all for going out of nuclear as fast as possible. but if another country decides to remove coal instead of nuclear power plants first, it is their decision and i am fine with it. though the idea that people here constantly bring up the accidents in chines coal mines, while cheering them on when they build nuclear power plants feels a a little strange. no, i did not miss that link. i think it is horrible. it tries to confuse people, by placing the solar peak at the same level as the daily peak. people who understand capacity factor would not do this. it also simply looks wrong. the solar output looks gausian (on good days), not like an upside down parabolic. summer sunset in Florida is at about 8 pm. as i explained before, smart meters will switch on climate system at the cheap solar peak time. at the moment, people switch it on when they get home. and all those graphs are flattened by cheaper prices at the low demand night time. Sod, you’re hopeless. What a giant waste of time you have been. I hope there are more reasonable people that have learned something from these threads, so not all is lost. posted 27 April 2011 at 7:43 PM by Cyril R.
I think people learn best by stark contrasts, Cyril. I think your patience, and that of others, has been admirable. posted 27 April 2011 at 8:07 PM by Barry Brook in reply to Cyril R.
I find your answer evasive, but I take it that you do in fact place a higher priority on eliminating nuclear power than on cutting GHG emissions. I quite understand why you don’t wish to state this more clearly. Oh wonderful. The smart grid will swich on the air conditioning furing summer from 11.00 am to 2.00 pm while everyone’s at work, and the house will have warmed up nicely for them by the time they’re back home. And we’re going to build massive solar infrastructure to achieve this. Great thinking there. Cyril, you should at least read Sod’s links before dismissing them. The paper compares total emissions and emission intensity of plants in 15 EU countries + South Africa, for the purpose of determining how SA compares to EU best – and worst – practice. Germany has high total emissions because it has a lot of coal plants, but it is in the best 3 on every measure for intensity of pollution / kwh of the whole group. The lignite plants are only marginally worse, and better than most coal plants. The UK is terrible, nearly 10X worse for SOx/kwh, causing continued (and justified) complaints from our neighbours downwind. Shutting down nuclear while keeping coal running is a poor environmental choice even in Germany, but not as much so as in most places – except for the CO2. The question for Sod – and anyone favouring the German nuclear phase-out – is how many millions of tonnes of CO2 are you prepared to dump into the global environment for the sake of easing your irrational fears? Whatever contribution renewables make to the grid, there is always a choice, shut nuclear or shut coal. In choosing to shut nuclear first, Germany is inevitably choosing to shut coal later than it could have been. i gave a link, that contradicts your claim. (they find German coal power plants to be among the least “dirty” ones among about 15 European States. so your reply “South Africa is not part of Europe. (! )” didn t really convince me. i simply can t figure out, why there would be ZERO solar output at 6 pm, 2 hours before sunset on a summer day in Florida. From the link above, you see that we get over 20% of solar nameplate capacity on a sunny day in Germany, 2 hours before sunset. That is way more than the capacity factor! again, you will need to show facts, if you want to counter my argument. my point was clear: we will move out of nuclear first. and we will reduce CO2 at the same time, as there is no contradiction there. not a real problem, as of course buildings have to change a little as well. we all want to drive down CO2, don t we? thanks for the post Luke, i only saw it after i replied. in Germany, the plan of our former red/green (Schroeder) Government to phase out nuclear (together with subsidies) started a massive investment by local suppliers of electricity (“Stadtwerke”) into alterantive energy. When the new Government changed this plan last autumn, by granting each nuclear power plant 12 more years, all those investments became problematic, as there wouldn t be a “electricity gap” to fill. so there is a specific reason in Germany, to shut down nuclear instead of coal. there is already a plan for the shutdown, which gives security to those who are ready to invest. i think that the additional CO2 production will be smaller than most here expect for this reason. as i said multiple times now, this is a decision that i make and that Germany made. if there was a country with extremely new and modern nuclear plants in very remote regions and it also is in the process of replacing extremely old coal plants, it might be a good decision to do it the other way round. the problem is NOT, that there was an accident in Fukushima. i was expecting this to happen sooner or later. but i am really shocked by the reaction of the nuclear industry. i would have expected fast changes. for example additional diesel back ups to be brought up all over the world immediately. i would have expected the industry to clear roof top storage immediately. (apart from the stuff that is in an exchange process. and i would have expected immediate attempts to improve flooding protection, for example with mobile walls. do people here really believe that Fukushima is the only nuclear power plant in the world, with inadequate protection against a tsunami? we also obviously need forces that are ready to fight a serious nuclear power plant accident. they need equipment and enough manpower. all these changes should have been an automatic response by the industry, for pure protection of their business. then later on investigations about errors could figure out ADDITIONAL specific changes learned from the accident. and commissions should think about DIFFERENT accidents with similar or worse results. Yeah – more security for the coal industry!. Yeah – more security for the coal industry! And Gazprom. Those Russians knew what they were doing when they purchased Schroeder. Sod, what bothers me about you is that you ask for evidence already given numerous times in other threads, and then somehow post links which you do not completely read and do not at all support your contentions. Nowhere did I say Germany emits the most of Europe, I said its problem is fossil fuel pollution. It appears to me as part of a diversion from the main arguments, like Finrod said. Germany is the third highest NOx emitter of Europe, at 221200 tonnes per year. This is not clean Sod. This is very dirty. Ecosystems do not like this eutrophication. It also lowers the human body immune system response. Germany is the sixth highest SOx emitter of Europe, at 202500 tonnes per year. This is not clean Sod. This is very dirty. Does similar things as NOx. Germany is the third highest emitter of PM10, at 7779 tonnes per year. This is not clean Sod. It is very dirty. It is highly carginogenic particulate matter containing various heavy metals including mercury and cadmium. Notice that ALL of this waste gets into the environment BY DESIGN of the fossil plants. When nuclear plants make every effort to effectively isolate their waste, less than 1/1000 of the coal waste (only 40 tonnes GWe-year LWR), from the environment and store it passively in dry casks, suddenly this is not acceptable, but throwing deadly carginogens into the air from coal plants is perfectly fine with you and should not be prioritised. By the way, something did change since 1978 – we are emitting twice as much CO2 today. Of course people like Sod will just claim that, uhm, relative emissions per kWh have reduced. Even Luke_UK seems to claim this nonsensical argument – the environment doesn’t care about relative emissions, wake up people. Is this so hard to understand? Sod, you Germans better get ready to burn fossil forever. Well, at least the Russians will be happy with you, selling gas and making like bandits. posted 27 April 2011 at 11:58 PM by Cyril R.
posted 28 April 2011 at 12:05 AM by Cyril R.
Sod, regarding industry response: its never a good idea to run around like chickens with no heads. Better is to first find out what exactly happened at Fukushima Daiichi and then make definate plans based on all the facts gathered. This is how it works when there is an industrial or chemical accident. I know because part of my job is to do QRAs (or PRAs) and these disaster induced changes take a lot of time. There was a major petroleum storage explosion in Buncefield, UK in 2005. We are still working on implementing techical measures such as independent overpressure protection valves etc. 6 years later!!! Now, when was the last time a 15 meter tsunami hit southern Germany? Oops southern Germany isn’t anywhere near the coast! Well done Merkel. posted 28 April 2011 at 12:12 AM by Cyril R.
Rest assured that the “what should change” process is already in full swing. When questioned on the process that led to one of Thomas Edison’s greatest inventions, he famously said, “I’ve discovered a hundred ways how not to make a light bulb”. This was his homey way of saying what most self-aware people understand… progress/improvement is much more often a result of failure than success. It is always the case in the aftermath of a massive event, be it natural or manmade (or in this case, both) that the armchair quarterbacks opine on how the response could have been better. But as, from their comfortable remove, they indulge in their schoolyard “I told you so’s”, serious people are busily going about the difficult business of picking up the pieces in an inherently chaotic situation. The armchair types are prodigious “problem identifiers”… since they admit of no boundary but what human imagination and dread can concoct, they operate in a limitless field… and flatter themselves profound. But they are (self)deceived… They contribute very little, all the while casting aspersions on the “problem solvers”. We will learn from this event, changes will be made, and though in the end they may try to take the credit, in truth it will be in spite of the silly armchair “problem identifiers” out there. Very well said John Rogers! posted 28 April 2011 at 1:16 AM by Cyril R.
Emission intensity matters because economics matters. Globally, we need GDP/person to go up, population is going up, though we hope not too far, so we need the energy intensity of the economy and emissions intensity of generation to improve, by a combined factor of well over 10, to avoid continued poverty and environmental degradation. Germany is one of the larger polluters in Europe, but the UK is worse, for a smaller economy, and Spain is ~3X Germany on NOx, SOx and particulates, with a fraction of the economic output to show for it. The environment only cares about the total, but people have good reason to care about intensities too. Luke_UK, what you are saying is what I’ve been saying: energy use goes up worldwide, so the cut we need to make is going to be greater. The nuclear plant replaces the coal plant 1:1. The NOx goes down 100%, the particulate goes down 100%, the SOx goes down 100% (building power station NOx , particulate and SOx emissions are negligible) and the CO2 goes down 99%. Everything that you electrify get same emissions profile! This is also why 50% renewable doesn’t cut it. Even 70% renewable doesn’t cut it. We need to electrify everything and get 95+% intensity reduction. I don’t see the economics tradeoff here because nuclear is affordable. Even with 10x economic growth you come out good on absolute terms which DOES matter for the environment (its the ONLY thing that matters for the environment) with all nuclear. What is more, the economy and the environment are usually not seperate: increasing emissions causes less agricultural produce, more healthcare costs etc. that are all negative economic effects. Combining the economic and the environmental costs, we get fully internalised cost. Doing that for a fully powered world with energy source X turns out that nuclear is that energy source X.
posted 28 April 2011 at 2:27 AM by Cyril R.
And energy source X is… the cheapest solution! posted 28 April 2011 at 2:28 AM by Cyril R.
Luke_UK, Cyril is well aware of the fact, that “emissions” per kw/h matter. “That’s 5,000,000,000,000 kWh of low cost, reliable, clean nuclear production. This has saved 75,000 people compared to coal related deaths (assuming US coal deaths per TWh) or 20,000 when replacing natural gas. Cyril just made a minor error above, when he claimed that Germany has some of the dirtiest coal plants in Europe. and we should just consider this issue solved. sorry, i wanted to include this link to the death per kw/h discussion above, but somehow forgot. Overall,an informative comment thread – congratulations to all. Speaking of comics,I have the 2010/194 page Beyond Zero Emissions report from Zero Carbon Australia on my computer. I don’t know why I leave it there.Maybe it is because I need a quick reference for beyond wally world ideas. Although ,with the prevailing insanity in so many other areas of need I doubt if it is of much special use. Actually,has anybody heard much of this report in 2011? Admittedly I don’t “do” the environmental wishlist sites much anymore as I wish to preserve my sanity,what there is left of it. The same applies to the Desertec scheme in Europe.Maybe the Arab revolts have promoted a few second thoughts on that. Meanwhile,our PM is lecturing the Chinese on this, that or the other.There is a long tradition of Australian leaders telling other nations what they should be doing while the home place is getting over run with feral flora and fauna. Anyway,while giving due credence to the several commenters who have pointed out the gross inequities and inefficiencies of feed in tarrifs etc,I will continue to nurture my solar system while I continue to get some return on my investment.When that dries up as I am tipping it will,I will go off grid,at least so I can continue to read BNC. Apologies for being flippant but that is part of the Maintain Sanity Program. Podargus, frequently in discussing nuclear power and emissions recently with environmental types the ZCA2010 report is thrown back as incontrovertible proof that we do not need nuclear. Its out there and its having an impact. Its an environmental travesty and criminally negligent, but its been well promoted, and its accepted at face value on its own terms by many earnest and well meaning people. The link provided by Sod clearly proves you wrong. Germany has the most coal power plants in Europe but they are among the cleanest. The interesting number is pollution per kwh of electricity produced. That is how you measure whether a plant is relatively clean or not. Look at the paper again. Compare the numbers of big power plants and compare the emmisions of NOx, SOx etc. per kwh of energy produced. Bill, what is it about the phrase “clean coal” that does not strike you as profoundly oxymoronic? If Germany’s coal plants were burning pure diamond they would still be an open sewer into the ecosphere. This is all very interesting. Please tell us more about how clean and eco-friendly Germany’s coal plants are. @sod: Please explain why radiation from a nuclear plant is a health risk. Under normal operation, there is no radiation health risk. Any radiation risks would belong under risks of an accident. Yes, but as already mentioned because of the well known externalities like GW and nuclear waste and black swans means coal and nuclear would not be legally permitted eventually. Its trivial because baseload of coal and subsidized nuclear makes it trivial, there are no reasons why it can not scale up, again remember power is hard, storage is easy. Metals tend to be recyclable, and in worst case scenarios can be disposed of in extremely stable compounds (zinc cadmium sulfide for example). Nuclear waste on the other hand is with us for hundreds of thousands of years, there is no way to get rid of it, even mythical breeders only use up actinides, leaving the plethora of dangerous isotopes that cannot be recyclable. As for Solar not following the peak curve, sometimes the easiest problems have a 18th century solution (Ben Franklin)… ever hear about daylight savings? its easier to conform schedules to the sun’s output than it is to get rid of nuclear waste. Still storage is needed and is not that expensive. Soon I will offer a possible $/kWh for scalable solutions and maybe ally some skepticism. Last but not least First Solar is a company, with shareholders, dividends, research and development, salaries, debts etc. Its survival is not relevant to scientists, but their manufacturing costs derived from their current technology means everything, we are not looking to INVEST in them but LEARN from them and information is not lost, if they fall anybody can pick up the torch just as easily as me typing this post. Aren’t discussions about how ‘clean’ coal plants are a bit irrelevant? The ‘cleanest’ coal plant is far dirtier than a nuclear power plant. Anyone who suggests otherwise is either ignorant or lying. sod, on 28 April 2011 at 3:21 AM — You written the wrong unit about three times now. The unit is kilowatt-hour, best abbreviated as kWh. Surely you can understand the inherent hypocrisy of stating as a “fact, that “emissions” per kw/h matter.” and maintaining your anti-nuclear stance? i do not think that they are clean. the claim was, that they are the dirtiest in Germany. from the data i have seen so far, they are not. not if you factor in all emissions. this is what the link i gave above does NOT. so if you do not look at “emissions” from a nuclear plant, you can NOT compare it to other plants. the approach is plain out stupid! but even if you come to the conclusion that there is no risk from nuclear fuel, you need to include it in the data you look at. completely excluding it is a false approach that leads to false results. Ask yourselves people: are ecosystems bothered by emissions per kWh or by emissions total? The latter is the the case. So yes, one dirty 50 MWe plant CAN be better than a clean 1000 MWe plant. What France is doing is closing down plants rather than trying to make them clean, and from the link Sod provided, France’s strategy is far more effective, whethere NOx or SOx or PM10 or CO2. How would you guys like to sniff 7000 tonnes of PM10? How about 200000 tonnes of NOx and SOx? Think that’s clean? I can’t believe how deluded some people here are. Does “environmentalist” mean you dropped out of high school? Only yesterday I pointed out that First Solar are losing money. Their shareholder funds, after allowances for capital raisings, are falling and their business relies on government handouts. Points from the First Solar current annual report, available from http://phx.corporate-ir.net/External.File?item=UGFyZW50SUQ9Mzk2ODQxMXxDaGlsZElEPTQyMTkwNHxUeXBlPTI=&t=1 follow. “First Solar aim to produce energy at 12 to 14 cents per kWh” This is still 2 or 3 times the current SE Australian average grid price, even before allowing for intermittency, cost of backup supplies and so forth. this is the world leader of an industry which survives only because it is on the public’s teat. The final two lines above were inadvertently transposed. ask yourself Cyril, are people bothered by deaths per kwh or by total deaths? why do you use one metric when it suits your point (death per kwh makes the small number of “solar deaths” high) and another one (high total CO2 emissions make the big CO2 output of German coal look dirty, even though they have a lower Co2 per kwh than other countries in Europe) when it doesn t? sod, thank you very much for your reference on the KIKK study. To put it in perspective, it is worth noting that NPP are not the only industrial installations which have effect on Leukemia, see for instance the case for a refinery : http://cat.inist.fr/?aModele=afficheN&cpsidt=22053367 . Apparently, there is no free lunch in energy. We just have to find the cheapest in terms of health impact, and nuclear still looks go, despite (or because?) attracting considerably higher scrutiny that other sources of energy. nuclear effects are not. pretty unfair, isn t it? I am often reminded by the Fukushima accident by the work of Dr Peter sandman who many of you may be familiar with. His work is based on the premise that humans perception of risk is almost inversely proportional to actual risk. He talks of parameters which magnify perceptions far beyond reality. Nuclear fits these parameters perfectly. Long after Fukushima eventually kills no-one and coal poisons the planet and renewables power the remnants of a shivering impoverished populace, nuclear will still be feared. And we will still smoke cigarettes. You never know. There is still time for humanity to overcome its fear of nuclear fission, before destroying much of the biosphere through prolonged use of fossil fuels (amongst other activities). If we do, I believe in a few hundred years time it will be looked back on in the same way as such historical events as the Salem witch trials. The KiKK study looks well done. We need more epidemiological work done this way. “What this case-control study cannot answer, is what causes cancer. Because solar is so pathetic in total kWhs not many people die; but in a solar powered world many more solar kWh mean many more will fall of roofs and much more metals will be used (solar is about 10x more metal than nuclear per kWh). You are suggesting a solar powered world where this matters. Of course there never will be a solar powered world, there could be a world with a lot of fossil and a little unproductive solar to greenwash it. In such a world, there will be much pollution and many deaths. In a nuclear powered world there will be fewer casualties than in a solar powered world because of less residual fossil fuel use. Plain and simple. Coal has killed millions, and continues to kill massively every day we keep delaying nuclear buildout. It is clear by now that Sod does not care much about people dying from lung cancer due to fossil fuel combustion so I’ll rest my case. It also appears that Sod believes that emitting hundreds of thousands of tonnes of NOx, SOx, heavy metals/particulate and hundreds of millions of tonnes of CO2 does not make Germany a dirty country. Indeed Sod asserts that with such emissions, Germany has no emissions problem of any consequence for us to prioritize its reduction. So I will stop wasting my time with Sod. Most people who are reasonable have gotten the point days ago, and those who are reluctant to view evidence that contradicts their worldview need time to think, so I will now my big mouth for a while. Deaths per kWh is also misleading because Solar is still a 21st century phenomenon, if no solar is installed going forward and deaths drop to 0, the ratio of deaths/kWh would continue to drop possibly below nuclear even. The problem I have with the deaths/energy source is that people are not really looking at it objectively, you object when I tell you that if Fukushima were a PV farm 0 workers would have died (remember a PV farm is not a residential inclined roof), but then go around extolling how much safer nuclear would be if more money is dropped in the pit of safety. Making Solar the lowest death/kWh source of energy is easy AND cheap, create installation safety standards (ie rope and harness for inclined roofs). Making nuclear safer now means a Gen V plant with permanently passive cooling, costing billions of dollars in design, billions of dollars in teething and it still leaves waste, and meltdowns are still possible though orders of magnitude rarer. John Bennets, you are an investor, good for you, I am not however, I view things in terms of scale not whether an individual company has a good PE ratio. They fold today then others will take up the mantle of producing $0.75/watt of course I rather they be subsidized so that we get closer to $0.5/watt as promised. sorry but the table on page 9 of the pdf does not include any substances of nuclear fuel or radiation in any form. it does include many cancer related substances that are produced by coal plants. your link to the psi is giving me the shivers. this is one horrible source for nuclear dangers information. so the people who like to release nuclear material into nature argue that this has little dangers? really? It is true that centralized energy generation, like from nuclear reactors, creates a power structure where individuals have to do certain things – like work at jobs they may not like – to get the energy. I have a friend who’s into “sustainability”. He wants to get along as well as he can by himself, without relying on the vast web of society. He lives out in the country and grows a lot of his own food. He is thinking of getting a geothermal heat pump, powered by photovoltaic panels. “thinking of” because it’s expensive. He lives pretty low on the consumption scale. He doesn’t spend much money for everyday things. He told me he couldn’t afford to have a dog, for example. So I guess the answer is, yes one can have “the alternative”. And it’s very thought provoking, to live in this super-simple non-consumerist independent way. I’m not sure if it’s given him special insight, but he seems quite clear-headed. But there are many aspects of it that most people wouldn’t want. Like spending a lot of their time farming, doing menial labor. Like being restricted from enjoying all sorts of things that are part of our large complicated specialized culture. But, one point is, it’s probably TRUE that we could get by with solar and wind energy, IF people DRASTICALLY restricted their lives to consume less energy. Maybe if they cut their energy consumption to 10% of what it is. Hardly anyone is going to do that voluntarily, though. We all have things we value. I would consume less energy if I were living like a rat in a giant apartment building, rather than in a detached house. I don’t have a car and I live close to town for that reason. But other people put a high value on living out in the country, so they “need” a car and the huge energy consumption that goes along with it. Etc. etc. etc. It would be lovely if we could somehow have the benefits of our highly specialized society, with far less energy consumption. I don’t know how such a thing could happen, though. I’m not talking about just “conserving energy” or buying energy-efficient appliances, but super-conservation: using a small fraction of what we do now. I live in a pretty low-energy way. No car, I get around on my bicycle. I’m almost entirely vegan; plant foods generally involve much less energy to create them than animal foods do. I have a heat pump, so I burn only about 1/4 as much natural gas for heat as I used to – in upstate New York. But even if almost-everyone could somehow be persuaded to live this way – I don’t think it would solve our energy problems. I don’t think it’s drastic enough. ps For example, a big chunk of my energy use is government – my per capita share of what the government is spending for this and that. Could *that* somehow be drastically reduced? I think the idea of a pro-nuclear cartoon book is wonderful! I would help with one. Surely you would agree that this is a very comprehensive approach? (DALY stands for “Disability-Adjusted Life Years”. This method of risk assessment combines the negative health effects of “Years of Life Lost (YLL) and “Years Lived with Disability” (YLD)… in other words, DALY = YLL + YLD). Clearly, radioactive emissions were taken into account, but interestingly, note that the radioactive damage factors required “approximation”… I’ll come back to that. From this it is clear that, contrary to your claim that radiation damage is unaccounted for in the ExternE study, it is listed as one of the “most important” pollutants (more accurately, “hazards”) taken into consideration. Table 9 assigns a multiplier to each species of pollutant/hazard to ensure it is given proper weight in the final calculation… in other words, if only a small amount of a particularly toxic species is produced during the lifecycle, its effect is multiplied by the “damage factor” to ensure its impact is accurately represented, and vice versa. Note that “Radioactive Emissions” are assigned a hefty damage factor of 50,000! This is the 4th highest damage factor on the list, and though you may perhaps quibble that it’s not high enough, you cannot claim it was ignored, nor even that it was given short shrift. 9b absolutely, and finally, explodes this assertion you made with reference to the ExternE study, and I quote, “radiation is NOT a health risk considered by this study.”, 9b depicts how the various pollutant/hazard species for each energy system under consideration contribute to the overall external costs. In the case of nuclear, a full 70% of the external cost is assigned to radioactive emissions! So, not only is radiation a consideration in the study, it is overwhelmingly represented as the primary health risk of nuclear power, and even when heavily weighted with a 50,000 times damage factor, the favorable outcome represented in figure 9a is produced. I would be obliged for some clarification from one of the other very knowledgeable posters here as to what “discounting” refers to in this statement, and how it would affect a “strong decrease” in the radioactivity contribution… I’ve never quite figured that out to my satisfaction. As for the rest, is seems pretty evident that most of the assumed radiological damages refer to dosages/dose rates that fall into the ambiguous, bottomless pit of unproven low dose LNT effects, which to me casts doubt on the propriety of a 50,000 damage factor. OK then… Mr. sod… will you now, in the interests of intellectual honesty, retract your objection to the ExternE study, to wit, “radiation is NOT a health risk considered by this study”? I ask this, not to salvage your reputation here, but because your answer will be revealing to those interested bystanders reading this thread from the sidelines, seeking to enhance their understanding of nuclear power. Perhaps some of them have found your tenacity compelling, and are in danger of mistaking obstinacy for honesty. Given the well deserved thrashing you’ve received, you may also have gained the advantage of having become an object of sympathy. However, few will be forgiving of maintaining a falsehood, so a response will reveal your true character. “A man who is honestly mistaken that is shown the truth has a decision to make… he can remain honest or mistaken, but not both. Yes, solar deaths are due in part to domestic roof falls. This is not the whole reason for that industry’s comparatively poor safety record versus nuclear. Once again, we have a single item response to a multivariate phenomemon. What about the mining, manufacturing, transport, earthmoving (big flat areas don’t grow on trees, you know), installation, operation and demolition, disposal and recycling issues? What about the cradle to grave issues relating to chemical usage in the PV panels themselves? Gen V? Whatever that may be, it has been demonstrated conclusively in this thread and elsewhere that NPP’s are now and always have been, safer than solar PV. For parity to be reached in this comparison, solar needs to lift its game, not nuclear. How strange! No manufacturer, let alone Solar One, the largest in the world, has stated that they are targetting a 0.75 cents per watt panel. Solartech have aimed their sights at 1.2 cents, as I quoted above. Their two statements to their stockholders indicate the corporation’s risk factors. In fact, there are pages of similar risk factors listed – I only targetted two. First, is this giant corporation’s BEST HOPE that their panels will be 1.2 cents per kWh, which is still far too expensive to compete with a whole range of other technologies; second, their stated concern that without continuing subsidy, their whole plan goes out the window (or words to that effect). So, Enviro, if you seek to convince rational, non-committed readers that solar PV is a viable option for the future, please provide links that demonstrate the practicality of 0.75 or 0.5c/kWh PV power and that this price has been arrived at without recourse to magic money gifted to the program via a taxpayer or via lopsided feed in tarrifs which serve one side of the industry at the expense of all others and of the customers. It is time for you to put up or to shut up. References, please. In what capacity would you be able to contribute? power station and somebody cries … its the nuke! sod, I don’t really believe you can misunderstand this. It’s obvious that the table on p9 refers to current emissions from transport. using hydrocarbon fuels. Your attempt to claim that coal is included is simply wrong – for example, there is no mention of mercury. The p15 ExternE table I pointed you at refers to accumulated external effects from all sorts of possible energy sources. In any case, I hope you went on to read the source documents at the bottom of the page I linked. If not, John Rogers above has kindly pulled out some key material for you to ponder. Perhaps you don’t like PSI because they’re accurate. Putting tiny amounts of tritium in large amounts of water is indeed harmless, but if you are conditioned to faint with horror every time radioactivity is mentioned, I don’t expect you to able to read rational arguments of that kind. Given the very significant stakes in the climate game, why are we spending so much of out time and effort arguing about so little of the problem? Time to re-focus, I suspect. Unrelenting climate change = lose the game. Against this backdrop, fiddling with solar freaks and other back door representatives of the fossil fuel industry? I suggest another tack… attack the FF technology which breathes life into intermittent generation… natural gas in all of its forms. Essentially, if it were not for ramped up natural gas, which includes coal seam methane, PV and wind would very much struggle. Thus, NG and CSM are indirectly responsible for much of the public and private treasure which has been wasted on untrustworthy generation. A rough estimate is that elimination of coal worldwide and replacement by wind plus PV plus GT’s would leave us with 40% of our current CO2 emissions due to electricity. My reasoning is: Since intermittent power is available only 25% of the time, a first approximation is that the other three quarters of the electricity is provided by a mix of OCGT at 35% and CCGT at 65%, ie say 50% of the CO2 output of straight coal. Three quarters of 50% is 37.5%. If the world was to switch instantaneously from coal to PV + Wind + PCGT + CCGT, the future CO2 output is still 37.5% of the amount we started out with. That’s for 100% abandonment of coal. At an annual global growth rate of 3% in electricity in all of its forms and assuming that non-FF power ramps up at the same rate, we get back to today’s CO2 output in 31 years’ time. Conclusion: Give the PV and wind proponents everything that they ask for and after 30 years the world’s CO2 output will be worse than it ever has been. Argue about my numbers if you wish, but the situation is clearly dire. Either do away with FF (coal, gas) in toto, asap, or learn to live or die with climate change. Any sideshow about intermittent non-solutions will, in a few decades, have run its course, either way. The only long term outcome variables are who gets rich along the way, Chinese, Danes, Germans, Wind, Solar. So what, when the earth is burning and every single harbour city in the world takes on the look of Venice, or worse? Footnote: A few resource wars should help to focus the minds of those who remain. Water, Oil, Arable Land, Grain, Failed Fisheries… what’s going to be the first to cause tens of millions to seek security through conquest? No amount of intermittent power will address these needs while climate change calls the global shots. I don’t feel trying to blame your neighboor seem to be the way to resolve the situation. This isn’t a simple energy transition, as I recall, they were significants protests in the France nuclear build. These things can’t be done so easily, and no, I don’t think it’s because of the “anti-nuclear misinformation” . I understand the pressure, but it is still trying to force someone to think the way you want: this may not be the way it should work. I don’t Merkel has it really easy, her government just lost some elections and massive protests have occured, the reasoning behind the shutdown of nuclear power plant is quite rational -> it’s to calm the public. it does not say “examples” nor does it say that it is limited to “transportation”. Now i do not know whether they simply for got to mention that the chemicals mentioned were just an example list. or whether the paper is outdated. so far i have not seen any good reason, why my assessment of the paper linked by Cyril is false. the new stuff linked by John Rogers and Joffan is different. as i said above, i have different reasons for my doubts for this newer (or more clearly stated?) results. i do not accept PSI as a source, because they have an interest in the outcome. i have linked the Greenpeace study on energy a couple of times. they also did an study on external cost and (obviously come to different conclusions. on nuclear energy they us the highest external cost of fossile fuels as an estimate, because it is difficult to get a different value. would you accept this number from Greenpeace? Actually, the kind of methodology that ExternE relies on is exactly why I think that the KIKK study, while significant in itself, is not sufficient to condemn nuclear power. Then we take the annual production of nuclear power in germany (2009, the last figure I found http://www.euronuclear.org/info/encyclopedia/n/nuclear-power-plant-germany.htm ) : 149 billion Kwh. Hence the external cost of NPP induced Leukemia in Germany should be 50/149000 euros per Kwh, I.e. 0.03 euro cent per KWh. If we want to be consistent, we would have to perform equally rigorous “KIKK studies” in Germany in the vincinity of every single industrial installation ! We would be in for a few surprise I guess. You will see an comparable increase of SIR for people living in winegrowing communities ! Where are the “Weinbau, nein danke” placards ? as you will be sceptical of the greenpeace study, i have serious, i have doubts about the treatment of nuclear energy in externE. “# Is the risk of a nuclear accident evaluated in an appropriate way? Evaluating external costs for the risk of a nuclear accident is a topic of long debate (ExternE 1995, 1998; Krewitt 2002). Currently, ExternE evaluates costs of a nuclear accident by multiplying the assumed probability of an accident by its assumed costs, derived from modeling studies. This calculation does not account for risk aversion, which is pronounced in the case of nuclear accidents, radioactivity, and large disasters in general. There is no agreed procedure on how to deal with risk aversion within a quantitative framework. It would be possible to develop an assessment scheme, e.g. by using participatory approaches to explore the preferences of the population with respect to different risk types, but ExternE has not been funded to do so. In any case, nuclear energy is a technology where opinions tend to be very strong. It is conceptually important to include an estimate of the costs of a nuclear accident in calculating the external costs of nuclear power. However, such an average value, or perhaps any monetary valuation, is unlikely to be persuasive. In this case, the value of the ExternE methodology may be more a means for steering the discourse into specifics and demonstrating which assumptions have to be used to support different opinions. # What about nuclear proliferation and security in the event of terrorist attacks? Nuclear proliferation has been a topic of long debate in ExternE (e.g., ExternE 1995:521-541, ExternE 1998 v. 7:483-491), but ExternE has not attempted to quantify the potential damages. EU member states have presumably analyzed the risk of terrorist attacks, likely including some quantitative analysis. However, information on these is not publicly available, so it is not possible to quantify the remaining risks. Thus both issues are not included in ExternE’s external cost estimates and have to be treated as gaps. ExternE has done no work on nuclear technologies since 1998. # Are long-term effects of nuclear energy treated adequately, in particular, nuclear waste storage and other land contamination? In estimation of the impacts of future normal operation of storage facilities for nuclear waste is included in the analysis. The risk of leakages has been examined only for low and medium-level radioactive waste. It is expected, and assumed in the analysis, that future storage facilities for high level waste will be built and operated according to strict standards and any remaining risks will be limited to the local zone, which would be chosen in a low population density. Therefore, according to case studies, any leaks would affect only a small number of individuals and the associated damages would be small. # The choice of nuclear power plant is crucial in determining the external costs of nuclear power generation. Why not include Chernobyl-type plants in nuclear power results, rather than modern plants? in each of these cases, they chose an approach that produces the smallest amount of impact. the fuel storage claim is completely absurd. choosing places with small population for the next 1000 years? this is obvious nonsense! thanks for the calculation charles! looks reasonable to me. the KiKK Study is completely different: they find an increase in leukemia, with a clear (possible) causal connection to nuclear material or radiation and with no obvious other explanation! The fact that nobody knows why there is such a wide variability in time and space of childhood leukemia doesn’t mean that nukes are the cause. Well, I don’t remember the book, but I do remember the arguments in favour of alternative technology, and the TV series set in some sort of post nuclear-winter scenario. Even though I was only about 10, the claims being made for renewables struck me as delusional (or dishonest as I thought at the time) – so actually books like this had the exact opposite effect on me than they desired. Our friend has again provided a link to a known biased organisation’s site, in an attempt to prove some point or other about the cost of wind power. I note that there is, as is depressingly typical for sites which have clear objectives which are pro-intermittent power sources such as SPV and wind, no indication as to whether the quoted cost of wind power is before or after the generators have placed their snout into the public trough of feed-in tariffs and the like. I, for one, place no credibility on such “data”. It is worthless, no matter how many links are provided to it. Perhaps, but improbably, Sod can produce something reliable to explain his case. You provided us with 4 instances where the ExternE study identified matters that they could not quantify. That you use these as a crutch upon which to lean to reject the whole of the report is somewhat odd, given that each of them, taken individually, has close to zero impact in my opinion. Of course, I have not justified my opinion any more than you have justified your own opposing view. They are both just that – opinions. We are not left with the realisation that the ExternE study is what it said it is, plus or minus your unsubstantiated notions of impending doom. Your attempts to debate with less and less by way of facts to support your much-valued “opinion” is both tedious and futile. How about learning to keep your opinion to yourself until you have located something to back it up? Sod, do you think Greenpeace has no interest in the outcome of a nuclear study? If you want to be taken seriously, don’t link to Greenpeace. Plus you must listen and ponder about what other people say, especially if it challenges your simple world-view of ‘solar good nuclear bad’ with evidence. You must read and comprehend their references, and not nitpick in order to claim minor victories as a diversion to the main arguments, which you have blatantly lost multiple times. Think about what the numbers say on nuclear versus solar versus coal. sod perhaps you can summarize for me how that greenpeace report wandered into the fantasy land of claiming that wind and hydro directly have negative external costs? Dams help the environment! Turbines clean the air! Not. And yes, I don’t accept their unsupported costs for nuclear, conjured apparently out of the fake “controversy” that anti-nukes attempt to push into the discussion, and set higher than coal or gas. actually i think they do. so i will not be surprised, if you folks will not accept numbers from Greenpeace without having a second look. i am sorry for ignoring your article. but i don t think it makes any sense Geoff! i don t find your arguments convincing. for example you can t simply compare cancer rates between different countries! i disagree strongly. a study that takes an obviously false approach (like assuming that final nuclear waste storage will happen in places with little population) is unacceptable. if you want to convince people, you need to take a different approach. in the end, i am rather sure that the real external cost of nuclear energy lies somewhere between the Greenpeace number and the ExternE number. the label of that line of the table says: “Nicht internalisierte externe Kosten”. Greenpeace starts with the cost of energy, as you find it on your bill they then calculate cost that the energy causes to society. so a negative cost says that such a form of energy is saving society costs, in comparison to the price on the bill. this is a completely reasonable result and has no connection to “turbines clean the air”. in Germany the subsides to alternative power are directly paid by the customers. ( the private customers, most industry doesn t pay) so these subsidies are very transparent, while most subsidies to coal and nuclear are hidden. I could help with writing and creative ideas for a pronuclear comic book. I’m not a cartoonist though. A long time ago I wrote a whole bunch of Sheep jokes for a calendar, with imagined cartoons to illustrate it. sod, that is complete nonsense. External costs are additional to any direct costs. In order to have negative external costs, the process of building, operating and decommissioning that energy source has to benefit the environment directly. After digging a bit, I see that what has happen is that costs have not been used at all. Instead they have used price, which is entirely unreliable. The report is even worse than I expected, which is saying something. there will be a normal “positive” external cost: external damage caused by production of the filter. but there will also be a “negative” external cost: less cancer caused because of the filter being used. here is a study from McKinsey about negative costs in the case of reduced greenhouse gases. To be fair, many hydroelectric dams do have positive effects that negate some of the impacts. Examples are flood protection, water buffering for agricultural use, and the provision of certain new habitats (large lakes). This does come at the cost of existing ecoystems, and most of the advantages accrue to humans. But you could say those are negative external costs. Solar and wind systemic costs are so high that it makes no sense whatsoever. The end result is that if you subsidise wind and solar, you end up paying a lot of money for greenwashing fossil fuels (the grid will be a majority fossil fuel grid). Germany is the worst eco-scam greenwashment of the century. posted 30 April 2011 at 6:11 PM by Cyril R.
On this site, Sod is communicating with scientists and engineers, trained and experienced people who deal with facts in their professional life. We are not News Ltd journalists or a bunch of young, eager but unknowing acolytes. Trying to find nuggets of truth in Sod’s biased and opinion-heavy but fact-weak sprays has become quite tedious. Further up, I noted in relation to the Greenpeace propaganda “… there is … no indication as to whether the quoted cost of wind power is before or after the generators have placed their snout into the public trough of feed-in tariffs and the like.” Sod has not responded to this, but Joffan has picked it up. Thanks to Joffan, we now know that Greenpeace based their report on prices, rather than costs. Sod further advises us that, by ignoring government rebates to customers, these subsidies are somehow not costs and thus can be ignored – waved away by the magic wands of PR, bias and spin. Further, and contrary to the posting rules of this site, Sod has explained that some fine print in German in one of his links might support his viewpoint. Come on, Sod – play by the rules. Costs are costs. Cost comparisons have nothing, absolutely nothing at all, to do with market prices. Subsidies are subsidies, including those which are quantifiable such as feed in tariffs and rebates but which have not been included just because they don’t help a particular partisan cause. Then, to top it all off, the same Sod makes a completely unsupported statement to the effect that all of this cheating is OK, because in his opinion there are mysterious subsidies being plowed into coal and nuclear. OK, Sod, it’s time to place the cards on the table. Let’s all have a look at the detail of these subsidies. List them, item by item, or stop kidding yourself that they change the outcome in the way that you would like us to think. They do exist… don’t they? Sod seems to constantly ignore the main argument: solar and wind are nondispatchable power sources that are not there 70-90% of the time. The consequence is simply: you burn natural gas, and loads of it. For every kWh of wind/solar you need more than 1 kWh of natural gas. That’s not good enough. posted 30 April 2011 at 6:31 PM by Cyril R.
i am not sure what your problem with the Greenpeace approach is. they want to know the full cost (to society) of the burger that i eat ta the moment. producing the burger requires space and work. this is factored into the PRICE of the burger, when i bought it. (it is internalized into the price) so they start with the price of the burger, when calculating the cost to society. the burger also might have positive effects to society, like making me stronger for work. this will cause a negative cost. with which aspects do you have problems? ps: of course subsidies to food production have to be factored into the cost to society! Cyril, sure that you have not understated your case? Two extremes during a notional winter’s evening in 2015 are, for a domestic demand of 3kW, at 30 cents = 90 cents per hour. BAD: Unfortunately, it is after sunset on a calm, wet day. Total wind available is only 20% of nameplate and zero from PV, so only 10% of scheduled intermittent load can be met. Blackouts ensue for 90% of the customers who had notionally sought power from renewables. Nuclear comment: For less capital outlay on a nuclear rollout spaced over 30 years and with a less ambitious portfolio of renewables, the market would not have spiked above normal evening peak prices of $100, there would have been no blackouts and the community’s health would have benefitted from the reduced SOx, NOx and particulates coming from fossil fuels. If only the decision makers had listened to our message during the past 40 years! it would help if people could tell me whether they can read the German paper or whether they can t. it does not make much sense to discuss a paper in detail, that people can t read. as i have said before, the feen-in tarifs for alternative energy (a subsidy) are factored into the price of energy and are paid by the (private) customer. so this subsidy is part of the price. so you bought that little house next to the Fukushima plant on the 1st of march? all your scenarios are extremely unrealistic. if you start paying $30 per night, some nice guy might support you with a diesel engine he bought for that purpose. or you could figure out that heating with electricity is not a good idea at all. even a rather small grid of wind will barely ever go down to zero output. so you do not need 100% of gas back up and this will not run 100% of the time. i think you are overstating the problems and ignoring the benefits of alternative energy sources. Denmark is running 20% wind and they didn t collapse so far! The gas backup won’t run 100% of the time, no. It will however supply the majority of your so called ‘wind and solar grid’. Hence, solar and wind are greenwashing. They pay the highest or second highest prices for electricity in all of Europe, and for what? Burning 2/3 fossil fuels? You are constantly ignoring the blatantly simple and devastating evidence against wind and solar. They don’t cut the mustard; all they do is lock yourself into fossil fuels indefinately at huge cost. Discussing with you, Sod, is like taking a ride with a little kid on a merry go round. Once you’ve been debunked of all your falsehoods, you just start all over again. Spinning and spinning and spinning. posted 30 April 2011 at 10:40 PM by Cyril R.
posted 30 April 2011 at 10:42 PM by Cyril R.
posted 30 April 2011 at 10:43 PM by Cyril R.
For the umpteenth time, price and cost are two entirely different things. If Greenpeace and Sod do not know the difference between the two, then anything that they say on the subject of the comparative costs of energy options is, not surprisingly, nonsense. In the end, only defined terms such as LCOE are truly indicative of the COST of energy. The Levellised Cost Of Energy is determined in such a way that the total of the input costs are established, thus enabling a comparison of costs between alternative sources. This site contains many articles which delve into the LCOE under various scenarios and technologies. So, if Sod wishes to conflate the two, there can be only two possible explanations for this. They are not as intelligent and well-informed as they should be… in fact, not as well-informed as the most basic of economics student – say juniour high school. Without basic understanding of these two basic concepts, any conversation re comparative costings of power is doomed, so, Sod, you have again brought nothing of value to the discussion and have failed to learn from our little exchanges. Even LCOE doesn’t tell you everything, as usually it only pertains to the busbar cost of power. For example the systemic cost of wind at high penetration makes it 3x as expensive, as per the DeCarolis and Keith analysis. Which is very optimistic with high geographic spreading and a good wind resource for the USA. Germany doesn’t have a very good wind resource; their generators only get around 17 percent capacity factor, fleet averaged. This means that their wind is not there on average 83 percent of the time. Their solar, with a capacity factor of 11%, is not there on average 89% of the time. Plus those two sources can’t be turned on when necessary. Do I really have to add a conclusion to this? posted 30 April 2011 at 11:33 PM by Cyril R.
This inevitably leads to the lawyeresque method of debate Mr. sod is engaged in… when your point is weak or insupportable, abandon logic and proceed to muddy the water… confuse the issue with meaningless information, brazenly dodge responsibility when you’re wrong, endlessly refer to spurious/inconclusive reports, not to prove anything, but to establish doubt. And when you’ve exhausted your stock of dubious intellectual capital… repeat! Manufacturing “reasonable doubt” is a legal trick to manipulate opinion, and is entirely divorced from the principle of Justice. Greenpeace has understood for decades that their task consists of public relations, not education. In the end, these tactics have nothing to do with truth-seeking, but are an effort to erect and sustain a false idol of/to environmentalism… and they have many eager, deluded acolytes. The techno-solar disciples have learned their debate tactics at the teat of organizations like Greenpeace… sometimes with purpose, often through osmosis. They have been weaned on the repetition they imbibed from the Mother Church, and are conditioned to use the “tactic” of directing an anti/pro nuclear discussion into something resembling battling a hydra… it doesn’t matter how often or decisively you decapitate a falsehood under one head, it is shrugged off with indifference and returns twofold under a slightly different aspect. In fact, often even the small effort of altering its appearance is disdained, and it returns in its identical form. You see this tactic used by the anti’s in every pro-nuclear forum out there… it is a phenomenon simply too conspicuous and regular to be an innocent product of chance or intellectual incapacity/laziness… this is a method. The heart of human reason is the ability to identify and understand patterns. Once a consistent pattern has been established, it must not be ignored. It is painful to observe the growing and understandable frustration of the well meaning, and very well informed commentators here. Take heart, friends! Maybe you’re just looking at this the wrong way. 2 – to needle and annoy, to provoke you into resorting to passion rather than reason. The pattern is clear… consciously or unconsciously, Mr. sod is an anti-nuke hydra… he is not here to learn, but to prevent others from doing so… and if he can provoke the honest commentators here while maintaining a façade of articulate politeness, all the better. All done. Case closed. Move along. ‘Nuff said. Next snakehead, please? How many other similar deflections are in this thread? Don’t be played… see this for what it is. “For the umpteenth time, price and cost are two entirely different things. sorry, but i really can t see the difference. b) you start from the price of electricity. you factor in costs, that have not been factored in already (these can be positive and negative). you end by a very similar number. the calculation of external costs is taken from a paper produced for the ministry of environment in 2006, not really a source that is friendly to Grenpeace. prices matter if you want to evaluate energy costs. at the moment for example, everyone can see on his electricity bill how much he had to pay (extra) for the feed-in tarifs. that his taxes also pay for building nuclear waste storage doesn t show up anywhere. at the same time, several towns in Germany have started to produce energy of their own. many of these institutions are not profit oriented and might provide electricity at a cheaper price (and that for obviously at a lower cost to society). thanks John Rogers, you are making my point. i brought up the Greenpeace study above, when it turned out that the nuclear numbers for the ExternE study are provided by the PSI. Sod: capacity factor and availability factor are not the same thing. Plus, your comment above is not a defense of wind and solar power as a substitute for basepower. It’s a dodge, smoke. So the only problem with solar and wind is, it’s not where you are. Such a small problem ..
On the global level, there are huge quantities of fresh water available. Kinda makes you wonder what we Aussies were complaining about with the drought a few years ago. The relation between capacity factor and availability factor is sometimes confusing (to me). It is my understanding that with nuclear, a .9 capacity factor is often expressed in terms of annual hours when the plant gets its rated power. So that would mean that out of 8760 hours, the nuclear plant was getting its 1 MW of power 7834 of those hours. With capacity factor applied to intermittent sources, it’s meaningless to use “availability” as a proxy, since it is available often at a fraction of its nameplate. I measured the cf for german solar on Jan 10 of this year as ~ 1.2 %. There were 4.5 Gwh of total electricity delivered out of a maximum of 372 Gwh (15.5 GW * 24 hrs). This ~ 4.5 Gwh were delivered during 3 hours in that day (it was evidently very, very cloudy). So the electricity was available at some level one eighth of that day, but the capacity factor was much lower than that. Availability is when your plant is available. You can have a 100% available plant but decide not to run it, for example if you have a peaker gas plant you might decide to wait for prices to go up and use this plant for expensive peaking power to make a lot of money. For wind turbines, technical availability is usually better than 90%, but that means very little, as the wind is unavailable most of the time!!! And when wind turbines fail, they tend to fail all at the same time, when there’s a calm period. Big problem. Same for solar; the solar panels are close to 100% reliable technically, but their resource, the sun, is not! As a consequence the solar plants all fail in the evening, in winter, and on cloudy days. That’s not good for Germany, which needs 70% of daytime peak power and night and most energy needs are during winter!!! In winter solar in Germany has capacity factors of zero (snow on panels) to 4% (sunny winter day). So your energy is not there 96 to 100% of the time. This statement is not subject to debate, it is techically accurate. Even in summer you only get 10-25 percent capacity factor, with big differences between days and even weeks, and of course zero power at night. It means the power is not there in summer 75 to 90% of the time. A nuclear plants typically makes at least 7000 kWh/kWp/year. World record plants that are optimally run get up to 8500 kWh/kWp/year. Solar plant in Germany makes on average 1000 kWh/kWp/year, and lasts only half as long as the nuclear plant. Consequence is that a nuclear kilowatt in Germany makes over its lifetime 14 times more electricity than a solar kilowatt in Germany. Solar is an extremely unproductive and completely non-dispatchable energy source. The kWh/kWp metric takes care of any ambiguity about availability, etc. I hadn’t seen that metric used here until you showed up (perhaps I’m wrong). I’ve got to remember that. sod: Of course you can compare cancer rates in different countries … age standardised of course. If two countries have different rates of some cancer, then there will be one or more reasons. Knowing the difference in rates won’t help much in finding the reason(s) but will alert you to the fact that you need to look. Who the hell runs the Antinuclear Australia website? I’ve only ever glanced at it occasionally, but the articles read like they’re written by semi-illiterates, let alone people who have absolutely no knowledge about science or engineering.